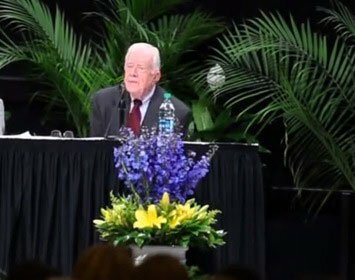 Does anyone really listen to Jimmy Carter about anything he has to say? Jimmy Carter the warlord? That’s how it sounded when the former president spoke out against President Obama’s ISIS strategy Friday. In one fell swoop, Carter has now become a hawk. Speaking from his retirement exile in Plains, Georgia, he criticized President Obama for not doing enough to stop ISIS. Carter’s comments would be page 16 news had the hypocrisy not been so overwhelming. It should be noted for younger generations that then-President James Earl Carter sat on his hands for over a year while U.S. embassy personnel in Teheran, Iran were held as hostages during that country’s revolution (1979-80). Not until his re-election chances began to disappear did he order the ill-fated rescue by Navy Seals and many of the rescuers were killed in the botched attempt. Former President Jimmy Carter speaks about ISIS at Grand Rapids Community College. Nevertheless, the former president, who lost the 1980 election to Ronald Reagan, said America cannot destroy ISIS without boots on the ground (much overused term). This is the same man who criticized Israel for sending soldiers into Gaza to destroy the terror tunnels that directly endangered thousands of Israeli civilians. For many in Washington, it is hard to stomach Carter’s criticism when he himself enabled Iran to overthrow the Shah and allowed the first radical Islamic terrorist regime. It would be laughable if it were not so pathetic. There is little doubt Carter is no fan of Israel. Carter has never met a terrorist leader he didn’t have good relations with, including the late Yasser Arafat. In retrospect, he also criticized former President Clinton for offering a two-state solution to the Palestinians and Ehud Barak in 2000-2001. The same Jimmy Carter who thinks the terrorist group Hamas is a legitimate political party. Yet, out of nowhere, Carter now condemns President Obama for being too soft on ISIS. Not only that, he condemns Obama for employing drone strikes against terrorists in general. There is little question that Jimmy Carter was a puppet for oil-rich Arab nations in the Gulf. This is all the more apparent these days in his taxpayer-funded retirement through his many foundations that receive millions from some of the most oppressive Arab regimes, such as Qatar, the terrorist-sponsoring regime. Carter supports the terrorists who attack Israel, but ISIS apparently is “different.” Why? The flow of money to Hamas and other organizations Carter favors will be cut off by the influence of ISIS, that’s why. Carter’s judgment is a rotating experience for the few who still listen. He can be heavily influenced by countries such as Saudi Arabia who donate large amounts of oil money into the Carter Center. When that happens, Carter’s mouth goes silent concerning human rights violations in that kingdom. The Nobel Prize winner is a resounding hypocrite whose true colors have become increasingly apparent in the 35-years since Ronald Reagan ran him out of the White House. Whichever side Israel is on, Carter will be on the other. He claims to be a “liberal,” but that doesn’t apply to Israel. He wholeheartedly supports Hamas. This is an organization that represses women’s rights (Where are you Roselyn? ), expels Christians, murders gays, denies any semblance of civil liberties, shoots dissenters, and generally suppresses all human rights. Carter long ago lost any credibility he had after his humiliating exit as a one-term flop. His most recent foray into foreign policy is just another tired example of a failed president who now second-guesses the sitting president. The country is a long way from the days of “Billy Beer,” Miss Lillian and the rest of the embarrassing Carter family and relatives. Although today’s president is about as popular as Carter was near the end of his one term, somehow the noise level is lower today. Whether that is because an Obama White House is in crisis mode 24/7, fully capable of silencing opposition with their experienced team of spinners and mainstream media allies, or Carter never had control of anything, period. Jimmy should hardly be lecturing the current administration about how to be tough on Islamic terrorists. Just ask the men who died in the aborted rescue mission he ordered to save the Iranian hostages long after the surprise was no surprise at all.